Conquer fear. Enact your life story. Chart your course in America by the Declaration of Independence, the Constitution and your life’s faith. Those are the keys to make America great and unify our country during a time of disunity, keynote speaker Gregg Riley told an energized audience at the Gateway Technical College Dr. Martin Luther King Jr. Celebration held in the Madrigrano Auditorium on the college’s Kenosha Campus today. “Every once in a while, don’t let America off her hook – make her live up to her standards,” Riley said during his keynote address, which he delivered following his re-enactment of a Dr. King speech. This year marked the 25th annual Gateway event to honor and celebrate the late civil rights leader. Presenter Kirstin Anglea spoke on the focus of this year’s theme, “The Power of Your Story” by talking about how revealing someone’s dreams and background to others builds connectedness – and disperses fear that causes division in a society. 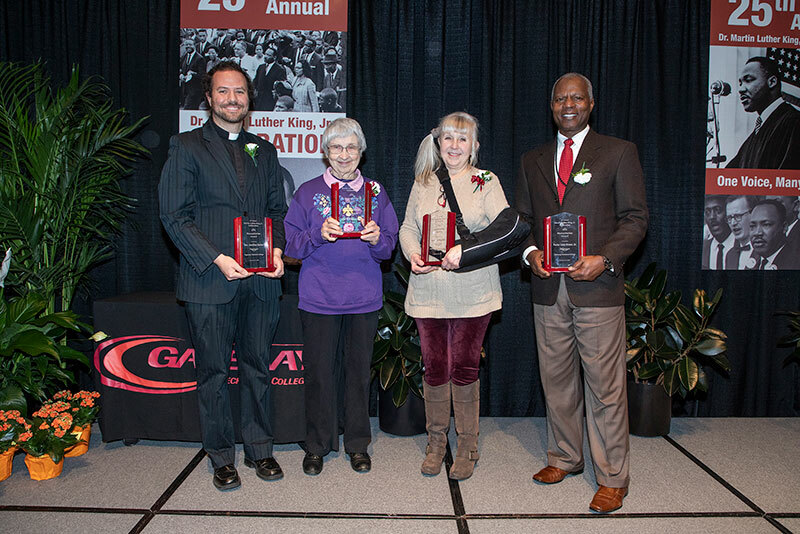 Gateway also recognized this year’s Dr. Martin Luther King Jr. Humanitarians, individuals recognized for their contributions to society, their school, business or profession, as well as their dedication to volunteerism or philanthropic work. Humanitarians honored were Rev. Jonathan Barker (Kenosha), Betty Brenneman (Racine), Pastor Leon Brown (Racine) and Karen Kempinen (Kenosha). Barker, along with Kempinen, started Empower Uptown, a way to encourage the guests at the Grace Lutheran Welcome Center and other low income residents in the inner city to see the value of voting, registering and casting their ballot – many for the first time. Brenneman is an active member of Coming Together Racine, a community group with a mission to actively challenge and eliminate racism in Racine. Brown heads up the Kingdom Manna Food Pantry and helped establish the Failure Is Not An Option Inc. (F.I.N.A.O.) 501C3 organization. Dreamkeepers – students from Kenosha Unified School District and Racine Unified School District – were also recognized at the event.